Don’t let corroded battery cables, cable lugs, accessory wires, or battery terminals keep your golf cart batteries from providing you with peak performance. Battery Boys exclusive 10-point procedure begins by removing and rinsing all battery cables, cable lugs, hold-down rods, nuts and washers, and any accessory wires attached to the battery terminals. Each component is then acid neutralized TWICE with a specially formulated cleaning and neutralizing foaming agent which confirms that all corrosion is gone. 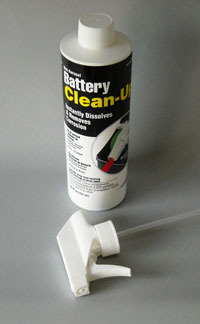 After rinsing, these components are re-inspected and recommendations made to the owner if there is a need to repair/replace any unusable/damaged components. Upon final assembly, each component is coated with NCP-2 Corrosion Preventative, an acid-neutralizer specially designed to prevent corrosion which reduces power and shortens battery life. 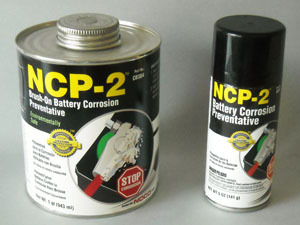 If corrosion develops on any treated component during the life of the batteries, and the NCP-2 has not been removed, then Battery Boys will re-coat those affected areas and repair or replace any component that has failed from the result of corrosion Free Of Charge to the original owner. It’s that simple.